The VWR Analog HeatBlock Dry Heat Block gives you great uniformity, and temperature control. This modular dry heat block lets you customize to your needs, this dry heat bath comes a single anodized aluminum sample block that’s a great thermal conductors giving you uniform heating throughout the block. 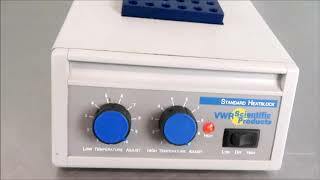 This dry heat bath is an ideal choice for culture activation, immunoassays, melting/boiling points, enzyme reactions and many more. With its high voltage, this heat block can be used on lower more gentle settles and on higher more intense settings, controllable through individual analog dials. The VWR Analog HeatBlock Dry Heat Block also features a thermometer well and close tube-and-block contact for maximum heat retention. This VWR Analog HeatBlock Dry Heat Block has been thoroughly inspected and is performing to expectations. All of our lab equipment comes backed with our standard warranty. Should you have any questions, please don't hesitate to contact us.